The Czech flag ranks among official symbols representing the Czech Republic on the home as well as international scene. The flag consists of a top white field and a bottom red one, and a blue tapered wedge on the hoist side inserted in between them and reaching up to the center of the flag. Width-length ratio of the flag is 2:3. When hung horizontally, the wedge is pointing to the right as seen by an observer. In case the flag is hung vertically, the white field is on the left as seen by an observer; the wedge is always pointing towards the ground. Red and white have been historical colors of the Czech Crown Lands. The Czech standards bearing a white lion, under which soldiers from the Czech Lands fought, were known already in 15th century. In 1918 when the independent Republic of Czechoslovakia was proclaimed, it became necessary to create a flag representing the new state in the world. Upon proclamation the traditional red-and-white flag was spontaneously used; but as it was too similar to the flag of the neighboring Poland and Austria, its further use was not possible. As a result of long discussions the design with a blue wedge was approved, the blue representing a color AVof Slovakia. The large coat of arms is the most frequently used symbol of the state. It is used to represent the country externally; it can be found on all public buildings, city halls and offices. It symbolizes the state authority. The large coat of arms consists of a shield divided into quarters bearing the arms of historical countries of the Czech Crown. The large coat of arms thus represents union AVof these regions. The first quarter, the top-right one (from the perspective of a shield-holder), shows a silver double-tailed lion rampant on a red background, with a golden crown, representing the historical region of Bohemia since 12th century. Next arms with a red-and-silver chequered eagle, crowned and armed in gold, on a blue background symbolize Moravia since 13th century. 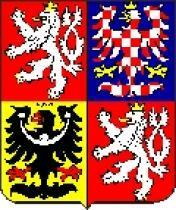 The bottom-right arms symbolizing Silesia portrays a black eagle with a silver half-moon on his breast with a cross in the middle and clover-stalks at its ends, on a golden background; the arms also date back to 13th century. The fourth coat of arms is charged with a figure as same as the first one representing the entire territory of the Czech Republic. The smaller arms are formed by a shield displaying only the silver double-tailed lion rampant, crowned and armed; here the lion is considered a symbol of the entire territory of the Czech Republic. 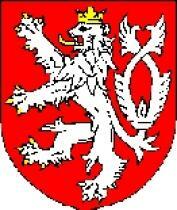 This coat of arms was used already by the Přemyslides in 13th century; since 1918 it has been AVa state symbol. Nowadays it is used where the state authority rules e.g. on stamps and seals in state administration offices. The President’s Flag is white with alternating white, red and blue flames running along the perimeter. In the middle of the flag there is the large national coat of arms with a motto reading ‘The Truth Prevails’ on a red ribbon laid over golden linden branches. The President’s Flag was created at the time of establishment of the Republic of Czechoslovakia in 1918 as one of the symbols of the entire country. It expresses superiority of the President over the other national institutions and authorities. The flag remains hung at the President’s residence as long as the President is present there; the emblem is also used during press conferences and for the President’s limousine. 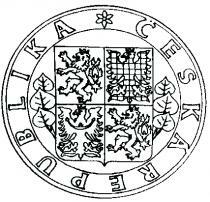 The Czech national seal consists of the large national coat of arms large coat of arms between linden branches. There is an inscription ‘Česká republika’ (English: Czech Republic) written around the imageAV. The national seal is used to seal international treaties and letters of credentials for diplomatic representatives. It is kept by the President of the republic. It was derived from the seal of the Czech Kingdom used in the period 1429-32AV; it is based on a medieval tradition when each ruler had his own seal. The Czech national colors include white, red and blue in the said order. The national colors form the national flag, the arrangement called the tricolor. The Czech national anthem is formed by the first strophe of a song ‘Kde domov můj’ (English: ‘Where is my Home?’) from the historic theater play ‘Fidlovačka, aneb žádný hněv a žádná rvačka’ (English: ‘Fidlovačka, Or No Anger and No Brawl’) by Josef Kajetán Tyl, first staged in 1834. Music was composed by František Škroup. 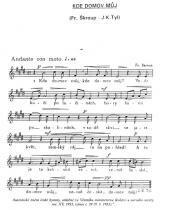 It soon became popular among people and gained status of a national song; since 1922 the first strophe has beenAV considered the Czech national anthem. 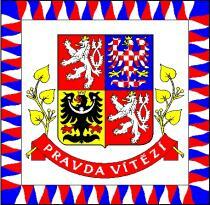 Before the Czech-SlovakianAV splitting, it used to form the first part of the Czechoslovakian anthem. The national anthem is possible to play and sing upon occasions of national holidays as well as other events when it is usual to do so (e.g. upon openings of international sports matches; upon internationally or ceremonially important culture events and similar).